As costs continue to rise for medical insurance, healthcare, and prescriptions medications it is more important than ever for agents to understand how they can empower their clients to be better consumers. 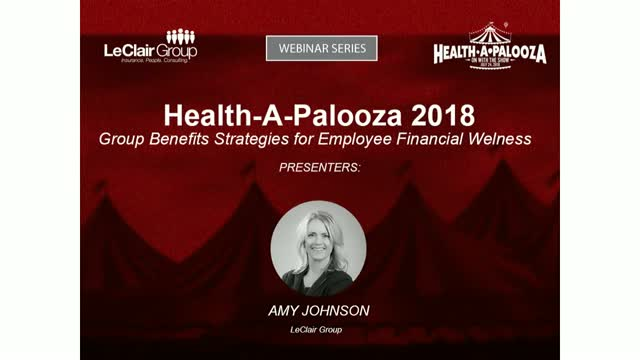 Understanding the concept of total financial wellness and bringing a portfolio approach to the employee benefits package allows for employees to have choice and protects them from risk when they need it most. OneShare, which is a Healthcare Sharing program,are programs offered by organizations called Healthcare Sharing Ministries. Healthcare Sharing Ministries facilitate the sharing of medical expenses among groups of individuals and families who have united to share each other's medical bills. Healthcare Sharing programs have become so popular, that In 2015, The New York Times stated that membership has grown recently because of the healthcare sharing ministries' exemption to the insurance mandate of the Affordable Care Act, and that monthly cost of membership in a healthcare sharing ministry is generally lower than the cost of traditional health insurance. In 2015, the Seattle Times also reported that membership has grown significantly in recent years. please join us for a webinar introducing Illinois Mutual and their individual Income Protection products, which are perfect for your hard-working Middle American clients. We'll be promoting simple sales concepts that lead to success with these budget-conscious prospects, niche markets to help you identify the huge opportunity for DI, and attractive features like our Return of Premium rider. Also, learn about the opportunity you have to earn extra cash with your quarterly production! If your client were to experience a hospital stay, traditional medical coverage provides benefits for medical costs during their stay. Once their hospital stay is over, they can rely on Hospital Recovery insurance to help cover certain expenses related to their recovery – which allows them to focus on healing. The Medicare market is exploding, and among the easiest ways for producers to capture their own slice of it is to offer Medicare Supplement products to their clients. Cigna has super-competitive, age-banded rates, so all folks ages 65 and 66 pay the same low premiums. And beyond that value to clients, Cigna has strong tools for agents, including an e-app feature that is quick and error-proof. The medical questions are structured so that, in most cases, you will know right from the answers on the electronic application if your client will be approved. Introducing LeClair Group's new Small Group quoting tool RateFactory. With RateFactory you can be ready for your client presentations within minutes! An introduction to Aetna's Medicare Supplement plans and why they may be the right choice for your aging-in clients. LifeSecure can help your clients stay in control so that they can feel better about the future. LifeSecure's Long Term Care products gives your clients the power to set coverage levels and premiums based on their perceived needs and personal budget. And its policy design offers tremendous flexibility when a claim arises, by providing coverage for a broad range of providers and services, including informal caregivers and family members. This webinar will discuss how LifeSecure's Long Term Care product can be a simple, affordable option for your clients. My Advantage Shop features a free online designer portal where LeClair Group appointed advisors may customize bespoke marketing materials to include logo, brand specs and/or contact information. Printed materials are deeply discounted and shipped directly to your door. Select templates will also be available for free download after customization so you may have the capability to deliver digital collateral. There is no shortage of clients who need your help when shopping for insurance. The challenge is knowing where they are, and how to reach them. Through it's sophisticated technology, LeClair Group's DataWidget is able to connect to a national database of millions of people around the world. These mailing lists can be customized based on a variety of demographics such as age, geography, gender, income, occupation group, house value, and home ownership. We invite you to join us on March 7 at 2:00pm CDT for a live demonstration of how to use LeClair Group's DataWidget. This webinar will help you better understand how to successfully set up the demographic filters so that you come away with the the right target marketing for your business. Final Expense products were hot in 2018 and getting even hotter in 2019. How many of your clients want to know that they have $10,000, $15,000 or even $20,000 for their final expenses? Attend this webinar to learn about Mutual of Omaha's Living Promise Whole Life product. Living Promise Whole Life is designed to help with final expenses and more. This affordable protection pays benefits directly to the person covering any final expenses, which in turn provides peace of mind. Amy Johnson, LeClair Group, Katie Miller, LeClair Group, Lance Nielsen, HR Services Inc.
Business owners, large and small, will at some point face an audit and many are not compliant. The Department of Labor has stated they intend to audit every business with under 100 employees by 2018. During the audits, the Department of Labor will be looking to ensure that employers comply with ERISA, PPACA and other employment laws. Noncompliance can be expensive and an unnecessary problem for your clients to face. Agents are increasingly being asked to provide recommendations and solutions. Are you up to date with the regulations and able to provide the right advice and solutions to protect your clients? LeClair Group offers you training and access to a great HR compliance service your clients. HR Services Inc. brings you Compliance Basics, that provides the tools and documents to pass the Department of Labor audits and avoid costly fines and lawsuits. Attend this webinar to learn more about Compliance Basics from Lance Nielsen of HR Service Inc.
A discussion of Blue Cross and Blue Shield's Secure Funding self funded Small Group plan, including plan designs, quoting and enrollment. We will also provide suggestions to help you identify clients that may be a perfect fit for coverage. A look at Blue Cross and Blue Shield's 2019 Small Group products, network, new online tools, ancillary and compensation. Additionally, a discussion of BCBS' recent partnership with Sharecare, the digital health company that helps people manage their health in one place. A look at Medica's 2019 Medicare Products for MN and WI. This webinar will discus all the different plans and will explore what options might work better for others. AARP Medicare Supplement Insurance Plans insured by UnitedHealthcare Insurance Company are health insurance plans designed to supplement Original Medicare. They help pay some of the health care costs that Original Medicare does not cover (like copayments, coinsurance, and deductibles). UnitedHealthcare offers AARP Medicare Supplement Plans A, B, C, F, G, K, L, and N (except in Massachusetts, Minnesota and Wisconsin, which have different plans and plan designations). Each plan has specific benefits so consumer can find one to best meet their needs and budget. A discussion of Allina Health | Aetna Funding Advantage self funded Small Group plan, including plan designs, quoting and enrollment. We will also provide suggestions to help you identify clients that may be a perfect fit for coverage. With over 20 years of Medicare experience in Minnesota, UCare should be on every agent's portfolio this AEP. Take a deep dive into UCare’s Medicare plan designs. The webinar will give an overview of the carrier’s robust service, support and training programs for agents.